We present a method for conditional time series forecasting based on an adaptation of the recent deep convolutional WaveNet architecture. The proposed network contains stacks of dilated convolutions that allow it to access a broad range of historical data when forecasting. It also uses a rectified linear unit (ReLU) activation function, and conditioning is performed by applying multiple convolutional filters in parallel to separate time series, which allows for the fast processing of data and the exploitation of the correlation structure between the multivariate time series. We test and analyze the performance of the convolutional network both unconditionally and conditionally for financial time series forecasting using the Standard & Poor’s 500 index, the volatility index, the Chicago Board Options Exchange interest rate and several exchange rates, and we extensively compare its performance with those of the well-known autoregressive model and a long short-term memory network. 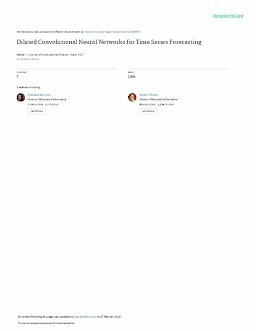 We show that a convolutional network is well suited to regression-type problems and is able to effectively learn dependencies in and between the series without the need for long historical time series, that it is a time-efficient and easy-to-implement alternative to recurrent-type networks, and that it tends to outperform linear and recurrent models.